Ascel Bio’s team has forecast measles and mumps outbreaks from over 10 forecast stations around the world for more than five years. Ascel Bio has created those forecasts using a variety of data sets, including data from hospitals, state public health agencies, and national governments. 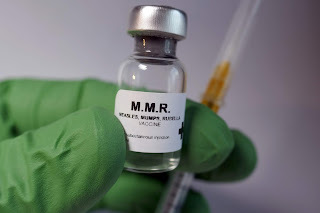 In the United States, a review of Ascel Bio’s prior years’ almanacs (a statistical breakdown of cases as opposed to a specific year's forecast) has shown that measles has typically peaked in the March to June timeframe and mumps has had a tighter peak between April and June. In countries with steady vaccination rates and public health attention, measles is “very forecastable”. Here, for example, is Ascel Bio’s forecast for Germany for the period between September 2018 and September 2019. 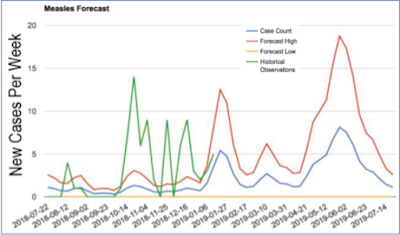 The red line is Ascel Bio’s forecasted weekly “high” number of cases, the blue line is what Ascel Bio forecast would be seen in a “normal” week in Germany, and the yellow line is what Ascel Bio forecast would be a “low” case count in a particular week. 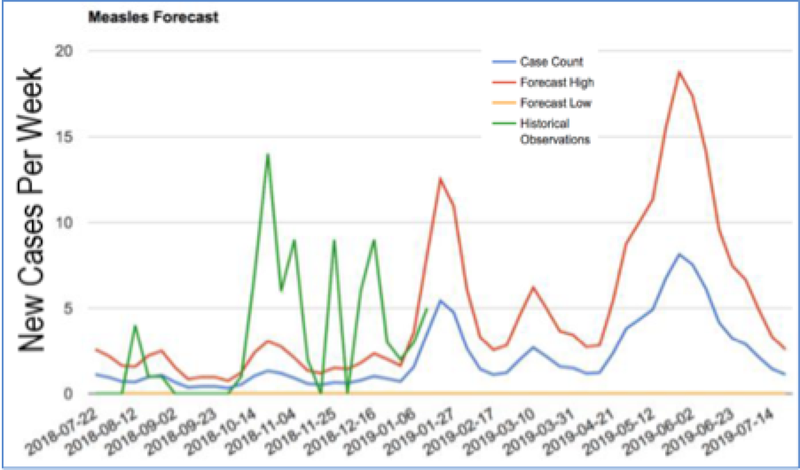 The green line is what has actually occurred – and with the exception of an early spike in February case counts are right within the range where we have forecasted. Our Germany measles 2018-2019 forecast is “validating”. But Measles has NOT been easy to forecast in the United States for years and our 2018-2019 forecast was deemed unreliable by our team (or, “not validating”) as early as October 2018. Again, the green line is what occurred, and the red line is the “high” number of cases forecast for the period. 1. Ascel Bio’s team sees a person’s health as a relationship between her access to care, her DNA, her lifestyle, and the environment. 2. Ascel Bio’s team uses environmental risk models to identify disease seasons within public health and hospital data sets, while also using environmental risk models to forecast threats from changes in the weather. We see a lot of environmental seasonality in measles (and mumps). 3. In normal conditions where access to care (such as access to vaccines) is largely the same and lifestyle choices (such as getting vaccinated) are too, the measles seasons are predictable. 4. There have been no changes in Americans’ access to care when it comes to measles vaccination in the past few months. So, some change in lifestyle choices is likely the cause of the higher than forecast cases of measles. 5. We expect that the current measles outbreak is going to strain health budgets, with hospitalization costs per case estimated in the tens of thousands of dollars. 6. There is no consensus yet in the United States on how to address resident’s changing lifestyle choices pertaining to vaccination. We are concerned about conspiracy theorists that use bogus science and we are also concerned that censorship approaches may backfire, resulting in a lack of a consensus and no progress in changing people’s lifestyles to reduce threats from measles.